HENRY VILLARD. 1835-1900, American journalist and financier, b. Germany. His first name was originally Hilgard. He attended universities in Germany, and after he reached (1853) the United States he did newspaper reporting. He won distinction in 1858 by reporting the Lincoln-Douglas debates, and in the Civil War he was a correspondent for New York newspapers. 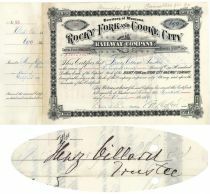 In 1873 he acted as agent for holders of Western railroad securities and soon became active in railroad financing. He organized (1879) the Oregon Railway and Navigation Company and gained a solid foothold in the transportation of the Pacific Northwest area. He then obtained a controlling interest in the Northern Pacific RR and became (1881) its president, but completion of the building of that railroad through the mountains bankrupted him (1883). With new capital Villard once more gained control of the Northern Pacific and in 1889 became chairman of the board of directors. He merged (1890) smaller companies to form the Edison General Electric Company (later the General Electric Company) and was its president until 1893. Villard obtained (1881) control of the New York Evening Post, which later (1897) came under the management of his son, Oswald Garrison Villard. He generously contributed to the Univ. of Oregon. 1890, Washington and Alaska. 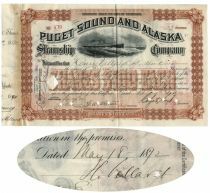 Stock certificate for 25 shares of the the Puget Sound and Alaska Steamship Company. BrownBlack. Lovely engraved vignette of a steamship in rough seas at top center. Printed by Franklin Bank Note Company. Issued to and signed on verso by HENRY VILLARD. Some light stub glue residue at left. Lightly punch cancelled and Extremely Fine. 1889, Territory of Montana. Stock certificate for 690 shares. Black. Issued to Henry Villard, Trustee and signed by him on verso. HENRY VILLARD (1835 - 1900), railway builder, financier, journalist. Glue residue at stub, minor bleed through from ink on verso. Fine. Stamp and punch cancelled, neither affecting Villard's signature.